Imagine working in a job where you are in a minority of only 5% of the workforce; a job that demands physical strength, thick skin and relentless determination; a job that is born from passion and is rewarding beyond words. The job I am talking about is backstage in the live music industry, and the 5% minority are women. So who are these women, and why are they so rare? What does it take to become a successful female sound engineer or lighting technician? Women in this industry feel pressure to work harder and smarter than their male peers, especially when new to the job. Strength of character and thick skin develop quickly when dealing with people (mostly men) who want to see you do an outstanding show before they will take you seriously. Discrimination aside, of all the women I have spoken to or read about, there is one common opinion that stands out. Gender is less of an issue when the job is done well. Sue Rogers, previously a studio engineer for Prince, and now an associate professor at the Berklee College of Music in Boston, describes working backstage as, “a renegade profession…an outlaw profession…you have to have a lot of swagger. A lot of swagger. If you don’t, you won’t be successful.” Sue continues to describe the industry as, “very intensive, very competitive, all-consuming.” She believes that women who want to succeed in this industry must sacrifice other fundamentally female roles, such as being a mother. I have recently discussed the topic with two London based women, both of whom work as freelancers at London’s Southbank Centre (SBC). 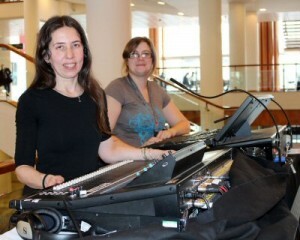 Eleonora Romano works as a freelance sound engineer, touring all over the world as well as working regularly at the SBC, and Roslyn (Roz) Malyon is a London based freelance Theatre Technician, and is also an experienced touring technician. When Roz’s dreams of being a professional dancer were shattered when she broke an elbow while studying performing arts at university, she turned her attention to the workings behind the stage and found a new passion. With encouragement from the head technician at her university, she learned skills that would later cement her career, such as followspot skills, rigging, focusing and how to program the lighting console.